You are here: Home / Charlottesville / Busy. Bites. Bloggers. Beers. 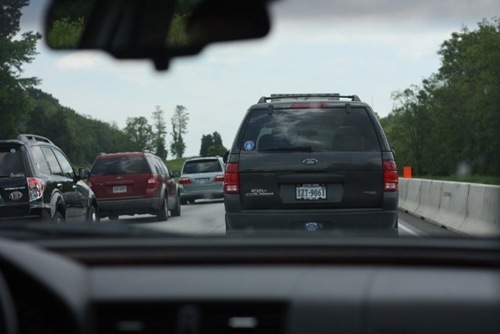 The car ride was…. long. We hit some traffic and it was uncomfortable, but we made it eventually. 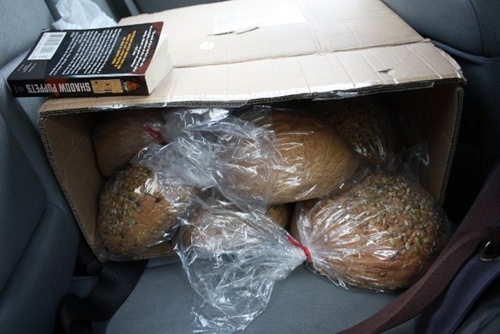 I rode beside a ton of bread – literally! 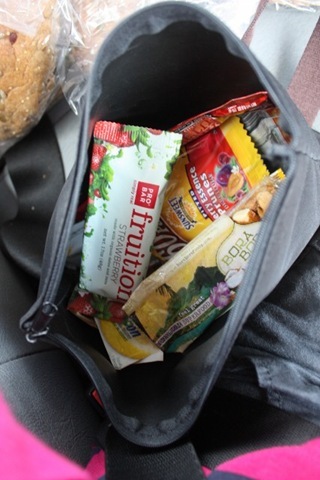 And then luckily I packed snacks because we hit traffic and didn’t know when we would arrive for lunch. My stomach was about to fold in on itself at noon! We split the Apricot Coconut. 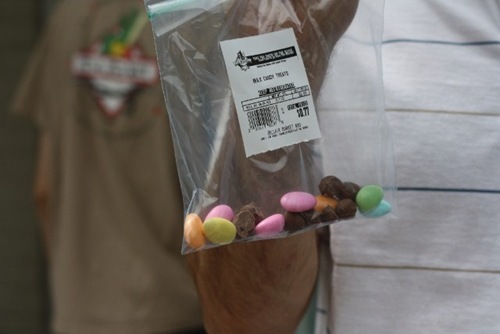 The ingredient list wasn’t bad, but it wasn’t ideal either….. When we finally arrived we hit up BellAir Market – a sandwich place in a GAS STATION that has been highly recommended by a number of people. That’s why I love Cville – gourmet food in gas stations! 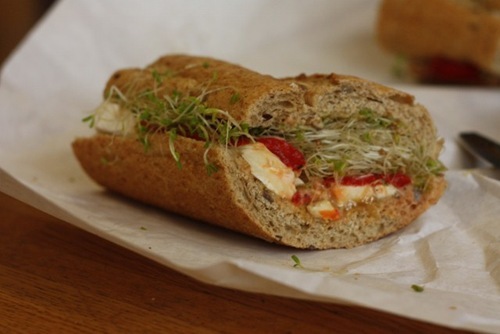 Karen and I split a baguette of brie + red peppers with sprouts and honey mustard. 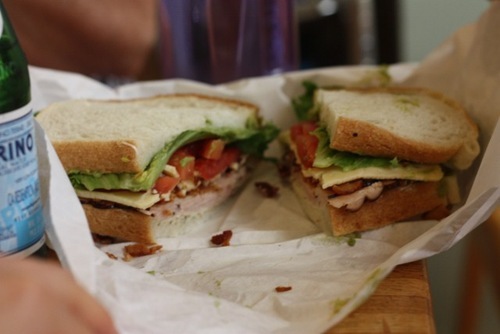 I heart brie but this would been better warmed..
Matt got turkey, avocado, bacon on sourdough. The sandwich was good, but the bread was just meh. Dessert was chocolate candied almonds!! So good! 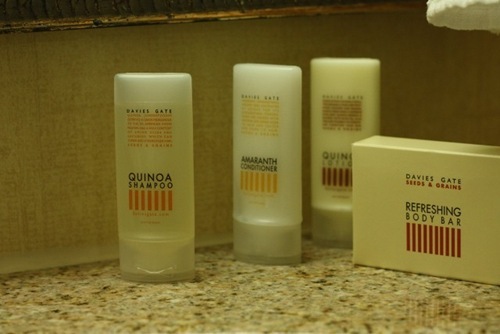 We went to our hotel to find QUINOA shampoo and AMRANTH conditioner! We’re eating at a Courtyard by Marriot – but I guess these might be local? 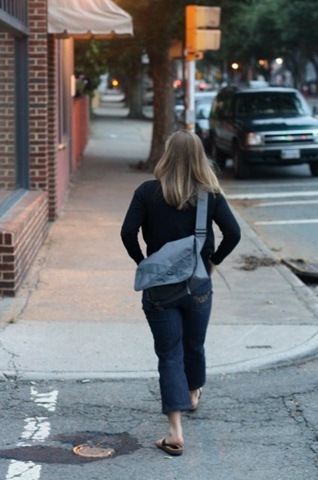 After a quick refresher, I went down to meet a handful of blog readers for a walk! We walked for about 45 minutes all around the UVA campus. Fun way to get to know these fun ladies!! Karen, me, Jessie, Cara, Jess, Sarah. 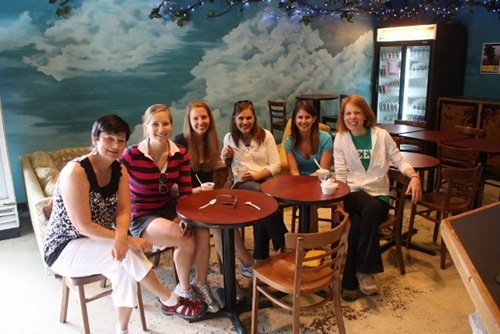 After working up a sweat, we headed over to Arch’s for frozen yogurt! They have all kinds of blizzard-like combinations with mix-ins galore. And a few simple flavors to add toppings to. You see that? That’s “Gooey Brownie” topping. Basically just straight brownie batter. HEAVEN! And 3.5 oz vanilla to act as the base. Great snack to tide us to dinner! Kind of wish I’d gotten a lighter, fruitier version because this kind of threw me off for dinner, but it tasted great. 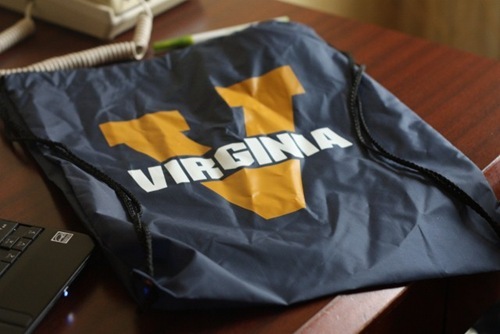 Sarah thought I needed to start supporting the university in our new town and brought me a nice back sack!! I love these things. 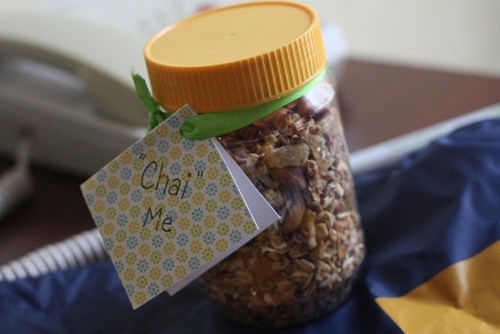 And she also brought some of her homemade Chai Granola. I took a nibble – SPOT ON chai flavors!! Can’t wait to have this on yogurt and oats! HERE IS THE RECIPE. She also brought me a sample of her Nutty Butter, only after we discussed it at our meet-up and she decided I needed to try it. So far I have only smelled it, but I cannot WAIT to dig in!!! RECIPE HERE! After the blog walk, I took a quick shower. Felt so good to get all cleaned up. 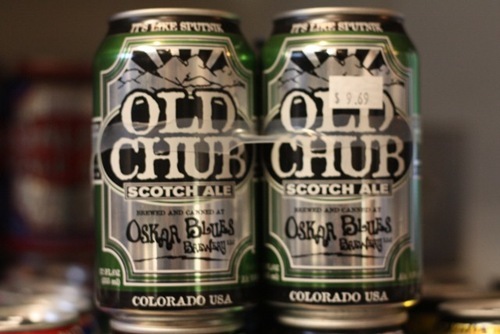 Then Matt and I went to Beer Run, which he has deemed the “best beer store ever” to check out some specialty beers. 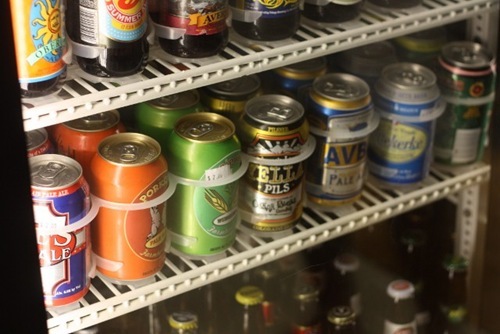 Canned beer is coming into style! I liked this one recently! After leaving Beer Run it was about 8PM and time to head to dinner at Maya. 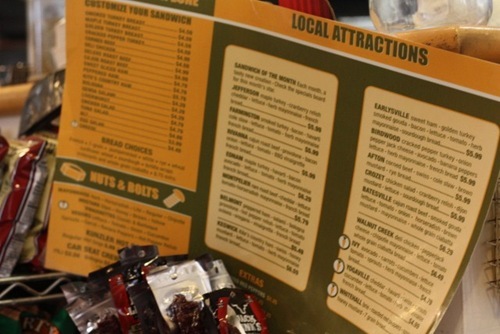 Featuring Southern, local food! And met up with Zeb, our Great Harvest advisor. I didn’t know what to get to drink: club soda, water, beer, wine, cocktails. Matt decided to order me a beer he thought I’d like, but I didn’t really like it. It was too bitter. I hate bitter beers! I still drank about half of it though. For dinner, after the sun set, I settled on the local trout (I love trout!) 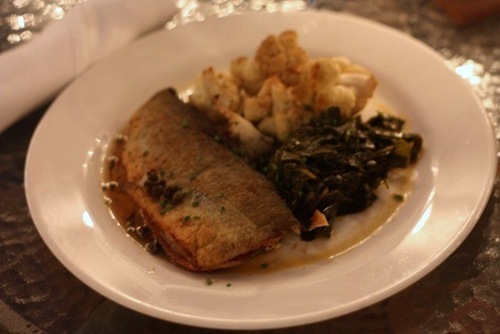 with collard greens and roasted cauliflower. 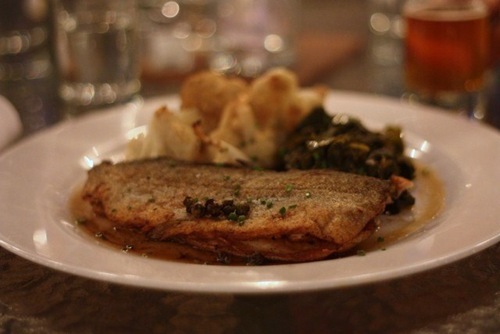 I asked for “light on the brown butter sauce” and it was pretty light. 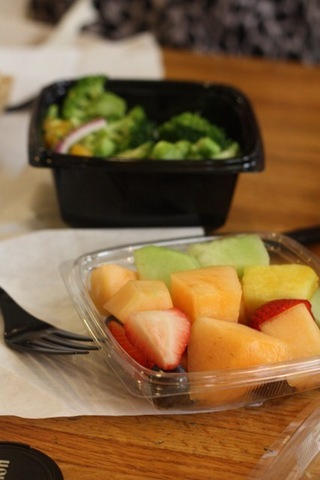 I ate most of my plate – it was all very fresh! Karen and I had picked out a dessert and were about to order when at the last minute we decided we’d already had one dessert that day and we were both full. A good decision in hindsight because I’m still pretty full, but I would still like a bite of something sweet! 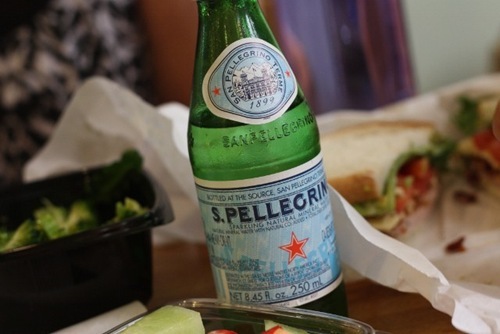 Sometimes you just gotta get over the craving. Tomorrow we’ve got a busy day that starts at 6:10 AM. So I gotta get to sleep! I haven’t had more than 8 hours of sleep in so long. Hoping this week I can catch up. Still very excited to move here!!! Ooooh, Arch’s Brownie Goo!!! I used to drive an hour from my tiny college in VA to C-ville just for an Arch’s fix 🙂 Good stuff. Looking at your pics brought back happy memories! It sounds like you are having fun! And you’re going to be moving to city that is NOT lacking in the delicious food department, by the looks of it!! Love the black shirt with the white detail. Looks like a fun day! Brownie goo. I love culinary ideas that a three year old would approve whole-heartedly of. 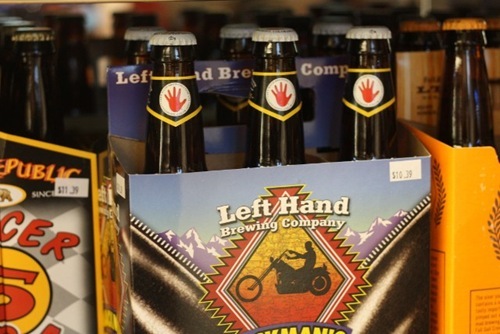 Left Hand makes a beer called Ginger Ju-Ju. Not only is it wonderful on its own, but if you’re every slightly nauseated, it does the drink – carbonation and ginger. And alcohol. Clearly I am not a medical professional, but hey, home remedies have their own place in the sun. 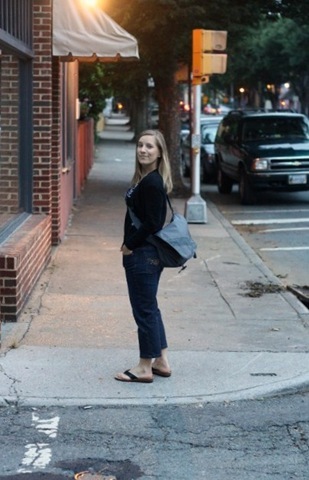 Enjoy Charlottesville – my dad’s from there and I love the town! That brownie batter looks FANTASTIC! 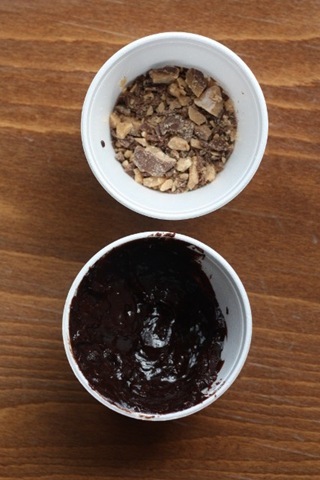 Oh my gosh brownie batter topping?!?! YES PLEASE. Whoever came up with that is genius! Glad you enjoyed your day, minus traffic 🙁 ugh seems to just be getting worse and worse. wow i can’t believe that gas station! 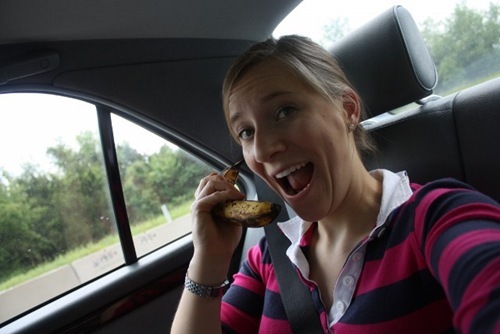 that reminds me of when i was in italy – the food at road stops was better than any restaurant in the states! OMG. You ate at Maya. That is my favorite place to eat in Cville. They have a butternut squash creme brulee on the menu right now that is amazing. How cool that there was gourmet food in the gas station! That’s awesome. 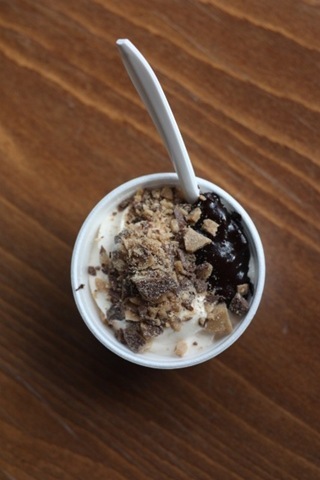 Looks like an amazing day.. and brownie batter topping!? amazing! I can’t seem to get over my need for something sweet after a meal. I just love dessert! I had the same toiletries when I stayed at a Courtyard Marriott in Panama City, Panama. They were great! Loved the lotion. Those are great shampoos…but, alas, I think they must be Marriott thing rather than a local thing. I enjoyed using exactly the same ones in a Courtyard hotel room in Sacramento just a few weeks ago! I’ve eaten at that gas station! I was visiting my cousin at UVA. 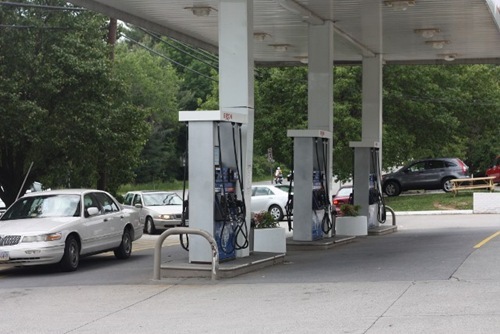 I think that gas station is mandatory when you go to Charlottesville! dude, i’m left-handed too! and a gourmet sandwich stop in a gas station?? yes, please! in oklahoma we just have fried chicken and taquitos! oh my – what a big day you have all had!!!!!! Because of you I’ve been craving beer for days! Hopefully I can fulfill this craving soon. Oh man. I’m a student at U.Va. 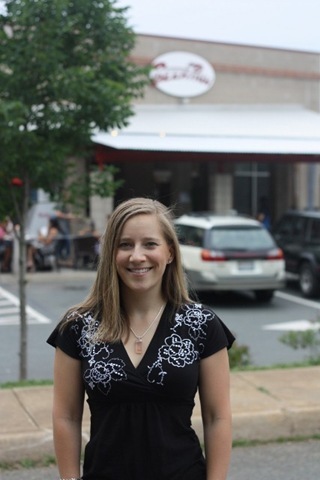 (and unfortunately not back in town until August) but I have to say it is so weird to see Charlottesville through the lens of Kath! Enjoy your stay, it’s a fabulous place with a surprisingly wonderful restaurant scene. Can’t wait until you move here! Ohhhh, I am not a fan of Bell’s beer either! They are waaaay bitter, especially the Amber. My boyfriend “made” me try several of their brews (yeah, like he really had to twist my arm) when we were in Michigan last year but I never warmed up to it. He sure enjoys them though! 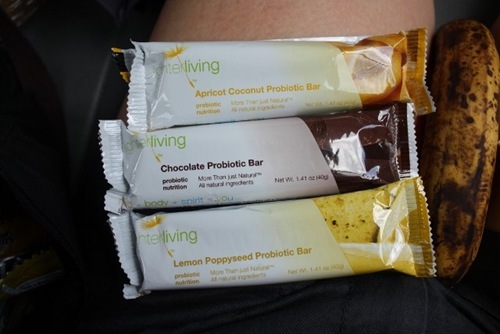 I’m bouncing around from food blog to food blog and keep running in to those lighter living probiotic bars. May have to check them out! Oh, and that brownie fudge topping looks amazing!! I seriously was stuck in so much traffic today too and no one in my family can relate to a crazy metabolism hunger and the smallest bladder. I don’t handle traffic well at all..where is my patience? It seems like you had a great rest of the day though in C-ville. Sounds like a place I would really enjoy. Can’t wait to read more about it in the future! 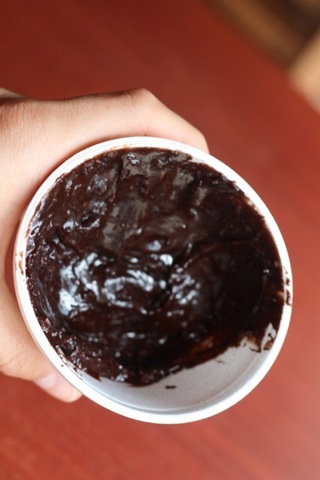 the brownie batter goo looks delish! i need to go to cville!! I used that shampoo & conditioner at a Marriott in Houston, I do believe. 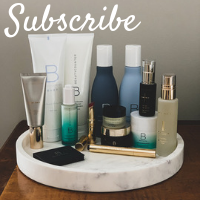 I am such a sucker for that type of thing – bath products with foodie ingredients. I recently stayed in a hotel with cilantro soap. So fun! And I am very excited to see what your new move has in store for you! That baguette with the brie looks delicious! Not what you would expect from a gas station. So neat that the gas station had a gourmet sandwich shop! The sandwiches looked pretty good! Love the frozen yogurt dessert! 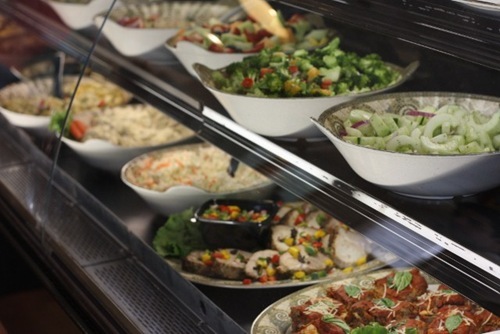 Adding an assortment of toppings is the best! I noticed the shampoo and conditioner you posted! I stayed at the Courtyard Marriott in San Francisco last Fall and they had the same stuff. Of course when I saw it I got excited, but it was stinky and my hair was terrible all weekend, hahaha!! It looks like you’re having a busy but good time! omg brownie batter. looks amazing!!! Oh. OH. I am drooling over that frozen yogurt right now. 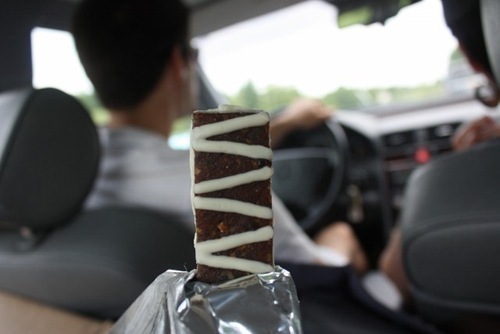 Brownie goo… droooool. That is so exciting that you are moving to Charlottesville! 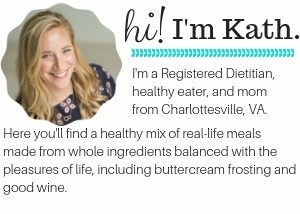 I grew up there and went to UVA, so let me know if you have any questions! It is such a great town and I really miss it! And gooey brownie, my favorite! 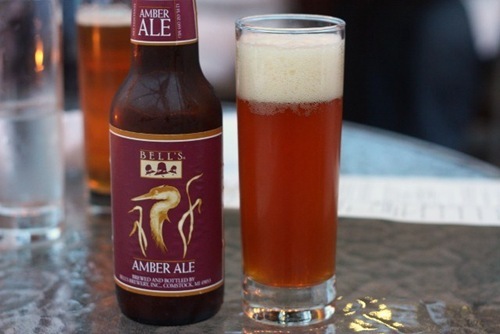 Next time Matt orders you a Bell’s beer have him pick a Bells Best Brown. Based on your favorite beer list you might like it (much!) better. I drink a lot of Bells as I am doing my part to support the sagging economy in Michigan! Looks like a great place to open up a GH. Best of luck. Love all of this!! There’s a supposedly really great Mexican place in a gas station near my school but I’ve always been nervous about trying it! haha I might just bite the bullet. Good luck on the scouting…it looks like a pretty adventurous day oven with the early rise and traffic! Your new city looks like a nice place to live! Have a great Monday! 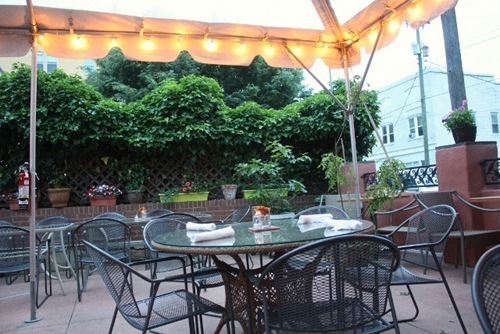 Also- Arch’s is just the best place ever. I did a project on the Archers in business school, and their story about how they met, fell in love, and started their own business is absolutely adorable. Reminds me of you and Matt! looks like such a cute fun place! 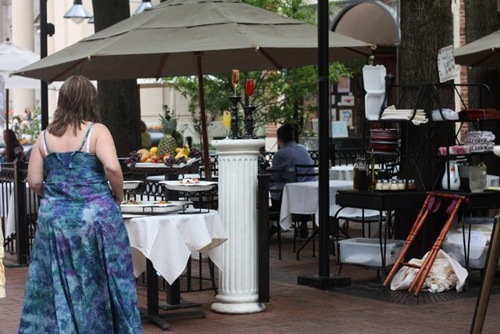 charlottesville looks like a wonderful and fun town! i can’t wait to see as you guys navigate that new adventure! Shoot! I miss so much when I don’t read your blog every day. So you are moving to Virginia? How lucky! I love that State. It is so pretty in many areas. Good luck and enjoy finding your way around. 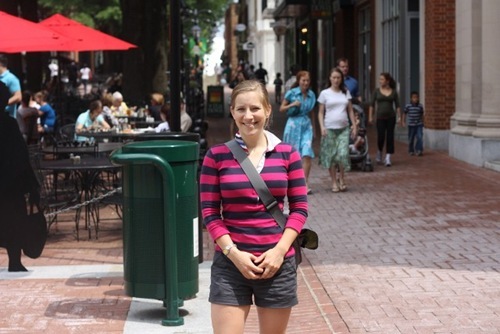 I think I’m going to cry – I miss Charlottesville so much! Go Hoos! Wow, looks like a great but very busy day!! Can’t wait to try out the chai granola recipe. Looks delicious. Cville looks like your kind of town, can’t wait to see more, so excited for you and Matt and the next step! Cville looks so amazing! I can’t believe they have gourmet food in a gas station and quinoa shampoo! That’s too cool! First of all, that brownie batter fro yo looks absolutely scrumptious! 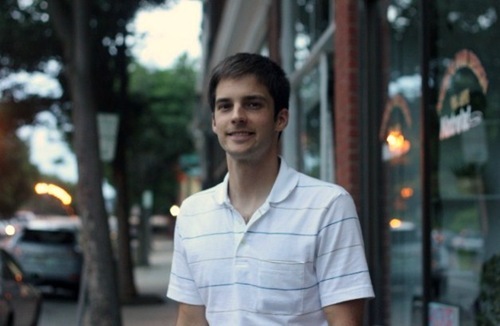 My son graduated UVA in 2006. 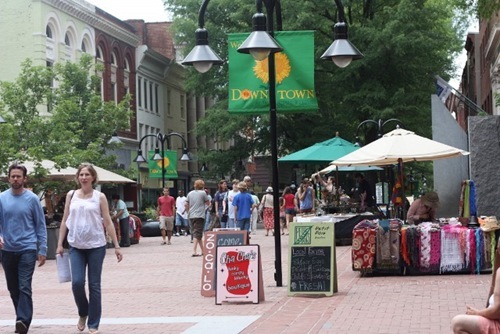 We still go back to visit Charlottesville, it is one of my favorite cities ever. I keep thinking that may be our retirement destination. I’m pulling for my 2nd son to choose UVA for grad school. I would love to live there. I am from Michigan, and love Bell’s Brewery. The Amber Ale is not my favorite, though. I see the beer store you went to had Oberon (it’s in one of your pictures – the beer with a sun label) – THAT is my absolute favorite by that brewery. Give it a try if you go back to that store. It’s a wheat beer, and only made during the summer months. 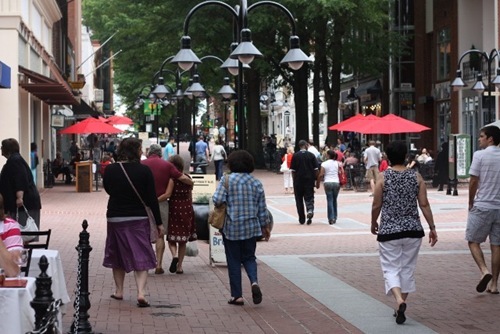 Charlottesville looks like a very cool city – good luck in finding a location for your GH store! I know what inspired your title for this post! The Office! “Bears. Beets. Battlestar Galactica.” Am I right?? hehe Wow, chai granola that is impressive! I definitely need to send you a few samples of my latest nut butters, since you are the nut butter queeeen!! I trust your taste 🙂 What a fun day, minus getting stuck in traffic. I love this post! Quinoa shampoo? Most people are probably like “WTF is this? ?” LOL. That is crazy! Downtown looks super cute. Love the glass that amber ale is in. Good luck with figuring everythign out for GH! an awesome day! looks like you’re having fun – can’t wait to see more! Shadow Puppets!!! I LOVE THAT BOOK!!! that’s my favorite place in all of virginia! my freshman year of college, we went to water street probably every weekend for the amazing food! if you haven’t tried christian’s pizza at the end of the street, DO SO! it’s heavenly. that’s an amazingly dark beer. wow. Kath, so sorry I missed you guys again! Looks like it was a whirlwind trip, though! 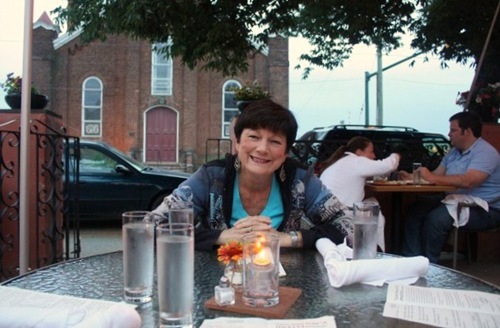 You picked some great food spots…Maya is my absolute favorite restaurant in Cville. 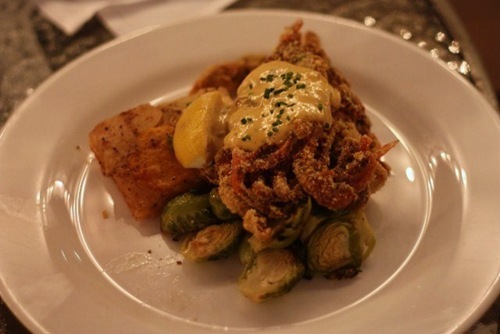 They work with so many local farmers and host great dinners featuring all local ingredients. And the food is fantastic, too. 🙂 I love Rev Soup as well, for all the same reasons. Good luck with your planning, hopefully I’ll catch you guys next time! 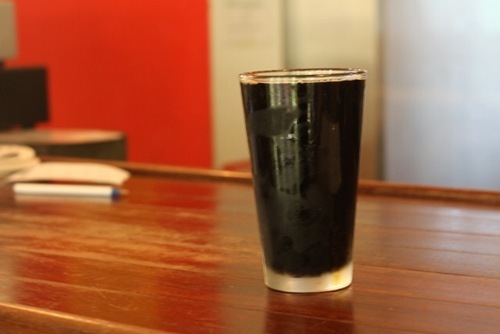 How did you like the BBC Bourbon Barrel Stout? 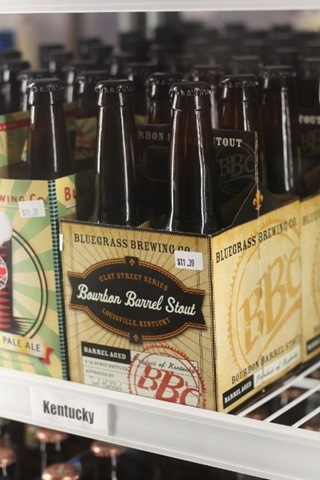 That is made here in Louisville, KY. It’s my favorite from the BBC, and is great on tap.